Born in Clinton, Iowa, on January 21, 1985, in a family of Italian descent, Giunta grew up in Cedar Rapids and Hiawatha. His parents, Steven, a medical equipment technician, and Rosemary, a preschool teacher, live in Hiawatha. He has two younger siblings, Mario and Katie. Giunta attended John F. Kennedy High School in Cedar Rapids. At age 17, while working in a Subway sandwich shop, he decided to enlist and joined the Army in November 2003. He married Jennifer Lynn Mueller, a native of Dubuque, in October 2009 after several years of dating. Giunta attended basic training and infantry school at Fort Benning, Georgia. He was deployed to Afghanistan from March 2005 until March 2006 and again from May 2007 until July 2008. Promoted to staff sergeant in August 2009, Giunta is currently stationed at Caserma Ederle, the 173rd Airborne Brigade Combat Team's base near Vicenza, Italy. He serves in the 2nd Battalion, 503rd Infantry Regiment, 173rd Airborne Brigade Combat Team and works in a support role for members of his unit currently deployed in Afghanistan. In 2007, Giunta was stationed at Firebase Vegas in the Korengal Valley, an area about 9.7 by 1.6 kilometres (6.0 × 0.99 mi) near the Afghanistan-Pakistan border, nicknamed by the soldiers as the Valley of Death. In late October, his company launched a six-day mission known as Operation Rock Avalanche. On October 23, Taliban fighters killed respected Staff Sergeant Larry Rougle and wounded two other infantrymen when Rougle's position on "Honcho Hill" was overrun. On October 25, company commander Captain Dan Kearney sent 2nd and 3rd Platoon back to meet with the local village elders and to recover from them the U.S. equipment that the Taliban had captured when Rougle was killed. 1st Platoon was tasked with providing protective cover and interdicting enemy forces from a nearby ridge. Shortly after nightfall on October 25, 2007, rifle team leader Giunta and the rest of the seven troops of 1st Platoon had just finished a day-long overwatch of 2nd and 3rd Platoon in the valley below. Although dark, there was sufficient moonlight that night vision equipment was not needed. They were returning to Combat Outpost Vimoto and Korengal Outpost. They walked about 10 to 15 feet (3.0–4.6 m) apart through the thin holly forest, along the Gatigal Spur of Honcho Hill at about 2,438 metres (7,999 ft) elevation. Sergeant Joshua Brennan, leader of alpha team and one of Giunta's best friends, was walking point. He was followed by SPC Frank Eckrode, squad leader Erick Gallardo, and then Giunta, who was then a specialist. PFC Kaleb Casey and Garret Clary followed Giunta. A 13-man Headquarters (HQ) unit led by Lt. Brad Winn, including a five-man gun team from weapons squad, along with a nurse who volunteered for the mission, followed immediately behind them. When the Taliban opened fire, Brennan was struck by eight rounds and Eckrode was hit by four rounds. Gallardo attempted to sprint forward, but RPGs exploding among the thin trees and 18 inches (46 cm)-high bushes around him along with machine gun and small arms fire stopped him. Unable to advance, he fell back to join Giunta's bravo team. While backpedaling and firing at the same time, he fell and was in the same moment struck in the helmet by an AK-47 round. An RPG round struck very near Giunta, who was returning fire and directing bravo team from a small defilade. Giunta was puzzled that the lip of the small depression he lay in was not protecting him from rounds cracking by his head, that they appeared to be coming from the north as well as the west. Giunta saw Gallardo take the bullet to his head and fall. Assuming Gallardo had been shot, Giunta rose and ran through the intense wall of fire to his side. As he helped the uninjured sergeant find cover, the ceramic plate in the front of Giunta's protective vest was struck by a bullet. Another round struck the SMAW-D weapon slung over his back. Giunta recognized that the extremely heavy tracer fire was coming not just from his west but from the north as well, a classic L-shaped ambush that threatened to roll over the squad. He ordered Casey and Clary to pull back a few steps to prevent the Taliban from flanking them. Casey was firing his M249 Squad Automatic Weapon cyclic and Clary was firing his M203 grenade launcher as well. The platoon commander in the HQ unit, Lieutenant Brad Winn, radioed Captain Kearney to advise him that their unit had five wounded men. The squad's medic, Specialist Hugo Mendoza, was among them. He had been shot through the femoral artery at the beginning of the ambush and died. Kearney ordered Second Platoon to assist Winn's platoon, but Second Platoon was in the valley below, some distance away, and had to first cross a river to reach them. Giunta and Gallardo gathered Casey and Clary. They were pinned down by the concentrated small arms and cyclic machine gun fire from a number of Taliban positions at close range. Less than 15 seconds into the ambush, Giunta and his men acted to disrupt the attack. They alternated throwing volleys of fragmentation grenades towards the Taliban about 15 metres (49 ft) to their west and moving north. Firing Pfc. Casey’s M249, Clarey's M203, and their other weapons, they advanced until they reached Eckrode. Shot twice in one leg and with two other wounds, Eckrode was attempting to unjam his M249 SAW. Gallardo, who later received a Silver Star for his actions, dressed Eckrode's wounds and called for MEDEVAC. Giunta, seeing that Eckrode was tended to, continued with Pfc. Clary to advance over the exposed, open ground of the ridge in the dark, looking for Brennan. When they could not locate him where they expected to find him, they ran after the retreating Taliban. The anti-coalition militia covered their rear with effective small arms fire but the Americans ran after them. Giunta saw three individuals and then recognized that two of them were Afghans dragging Sgt. Brennan, one by the legs and one by his arms. Giunta pursued them, firing his M4 carbine as he ran, killing one (later identified as Mohammad Tali, considered a high-value target). The second Afghan dropped Brennan and fled. A Spectra AC130 gunship shortly afterward spotted someone carrying Brennan's rucksack and killed him. Giunta said, "I ran through fire to see what was going on with [Brennan] and maybe we could hide behind the same rock and shoot together ... He was still conscious. He was breathing. He was asking for morphine. I said, 'You'll get out and tell your hero stories,' and he was like, 'I will, I will.'" After reaching Brennan, Giunta pulled him back towards the rest of the squad and cover, comforted him, and examined him for wounds in the dark. Brennan was grievously hurt. The 2nd and 3rd Platoons arrived to reinforce their squad and render aid. Giunta continued to assist the medic and adjust security while they waited for evacuation. The ambush had lasted three minutes Later the next day, Brennan died while in surgery. Gallardo told Giunta later on, "You don't understand . . . but what you did was pretty crazy. We were outnumbered. You stopped the fight. You stopped them from taking a soldier." Eckrode said of Giunta. "For all intents and purposes, with the amount of fire that was going on in the conflict at the time, he shouldn't be alive." Giunta learned two days later from Captain Kearney that the captain was going to recommend him for the Medal of Honor. He was uncomfortable about being singled out and labeled a hero. "If I’m a hero, every man that stands around me, every woman in the military, everyone who goes into the unknown is a hero,” he says. “So if you think that’s a hero—as long as you include everyone with me.” Giunta insists that his actions were those of any man in his unit. “In this job, I am only mediocre. I’m average." "I did what I did because in the scheme of painting the picture of that ambush, that was just my brush stroke. That’s not above and beyond. I didn’t take the biggest brush stroke, and it wasn’t the most important brush stroke. Hearing the Medal of Honor is like a slap in the face. " 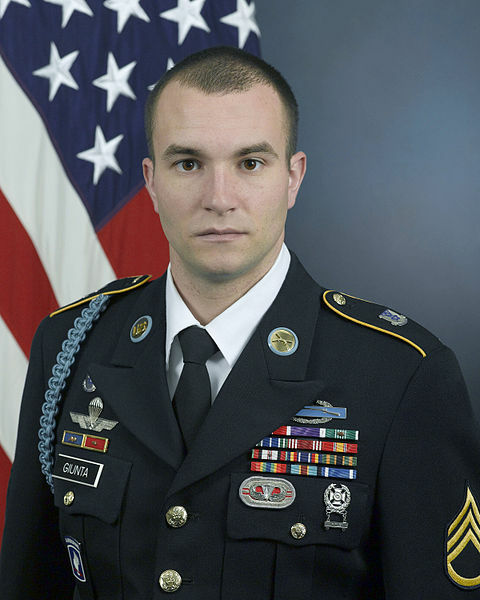 On September 10, 2010, the White House announced that Giunta would be awarded the United States' highest military decoration, the first awarded to a living recipient since the Vietnam War. He received the medal from President Barack Obama during a ceremony at the White House on November 16, 2010. All of his surviving squad members also attended the ceremony. "I'm not at peace with that at all," Giunta said. "And coming and talking about it and people wanting to shake my hand because of it, it hurts me, because it's not what I want. And to be with so many people doing so much stuff and then to be singled out—and put forward. I mean, everyone did something." Giunta is the fourth Medal of Honor recipient from the War in Afghanistan, after Navy Lieutenant Michael P. Murphy, Army Sergeant First Class Jared C. Monti, and Army Staff Sergeant Robert James Miller, the others being posthumously awarded the medal. Staff Sgt. Sal Giunta has opted not to re-enlist and will leave the Army, in order to move to Colorado and pursue his education. See pictures from Sal Giunta Day in Photo Gallery.